BEIJING, China (CNN) -- Six more people were sentenced to death Thursday for their roles in July riots that killed about 200 in western China, state media reported. 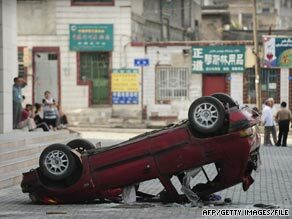 A car lies overturned in the wake of the July unrest in China's Xinjiang province. Three of the six received death sentences with a two-year suspension, the Xinhua news agency said, a penalty usually commuted to life in prison. In addition to the six, three others received life sentences from the intermediate court in the Xinjiang Uyghurs autonomous region, Xinhua said. Five others received various prison terms, according to Xinhua, bringing the total sentenced Thursday to 14. It did not provide further details. Xinhua did not say whether the defendants were minority Uyghurs or majority Han Chinese. The latest convictions come after six Uyghurs were sentenced to death by the same court Monday. Long-simmering resentment between Uyghurs and Han Chinese flared after a June melee at a toy factory in Guangdong province, leading to the July riots, according to Xinhua. A massive brawl broke out between the ethnic groups at the factory, resulting in the deaths of two Uyghurs, Xinhua said. The Uyghurs are mostly Muslims in western China's Xinjiang province. Some Islamists refer to the region as East Turkistan. Last month China sent 7,000 officials to Urumqi to ease tensions after Han Chinese protested a series of attacks in which syringes were used as weapons. The syringe attacks by Uyghurs started August 17.